Tibet boosts ecological protection for purity of "roof of the world"
China's Tibet Autonomous Region is stepping up efforts to protect its ecological environment and achieving admirable results, local officials said. 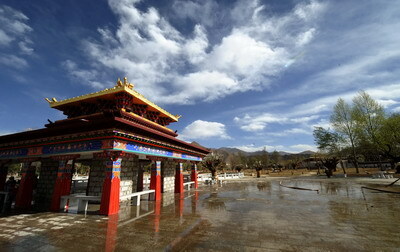 "So far, Tibet has reported no pollution incidents or acid rain. Tibet is still what it was and one of the places in the world that boasts the best natural environment," said Qiangba Puncog, chairman of the Tibet Autonomous Regional Government. Such results were attributed to the arduous efforts of both the government and local people over the years. Seeing the ecological environment in Tibet is vital to China and Asia, as the region is dubbed "Asia's water tower," local environment authorities have focused their efforts on rural environment protection, pollution control and conservation projects. Covering about one-eighth of China's land territory with a population of 2.8 million, Tibet had been allocating significant funding in this regard, said Qiangba Puncog. So far, about one-third of Tibet's vast land has been zoned into 38 natural reserves, an unprecedented size across China. The protected land is separated into nine state natural reserves, six regional habitats and 23 at the county level with a total area of about 400,000 square kilometers. The region is also home to seven national parks and three national geo-parks, in addition to 21 ecological function reserves. The Tibet Plateau boasts a unique eco-system due to its various landforms and different weather patterns. It is a major gene bank ensuring global biodiversity and home to 125 species of wild animals and 39 types of wild plants. 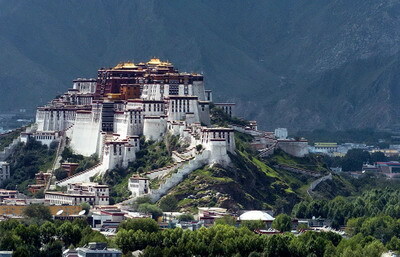 The Potala Palace, Tibet's signature architecture at the heart of Lhasa, was made a World Cultural Heritage site by the United Nations Educational, Scientific and Cultural Organization (UNESCO) on Dec. 16, 1994. 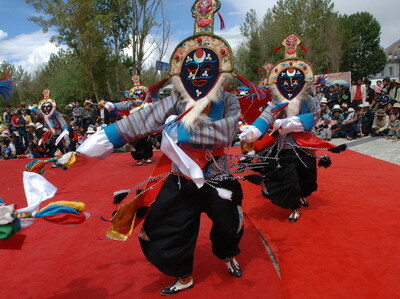 Rural environment protection is a priority in the local ecological protection scheme, as farmers and herders account for 80 percent of Tibet's regional population. In the greenhouse of Wangmu, a mid-aged Tibetan farmer in Duilong Deqing, a county under Lhasa, cabbage and tomatoes are mushrooming in defiance of the chilly air outside. But the primary function of the 40-square-meter greenhouse is to provide a warm environment to allow animal dung to give off methane gas, which her family uses for cooking fuel. "Methane gas generated here is piped into our kitchen (where it is burned on a stove). It takes just a few minutes for a kettle of water to boil," said Wangmu, as she pointed to a white plastic tube inside her greenhouse. It was connected to a methane pit beneath the family's pigsty. Though methane gas has long been used in many other rural areas around the country, it was technically difficult to get the animal waste to a high enough temperature on the plateau before greenhouses were built to solve the problem. "Thank goodness, I don't have to burn the dung patties anymore to make a fire," said Wangmu. The thick acrid smoke from burning dung used to sting her eyes and left the walls dirty. The generating facilities -- comprising an "up-floating" bio-gas system, with a small tank that employs simple technology and requires dung from only one cow or three pigs -- can generate enough methane to last five hours a day. The average life span of the facilities is between 15 and 20 years. In addition, a methane stove can annually save a household 4,000 yuan (about 572 U.S. dollars) and 2,500 kilograms of firewood every year, equivalent to protecting 3,000 sq m of wood, according to the Tibetan Agriculture and Animal Husbandry Department. "It cost 2,000 yuan to build the facilities. The government paid for us," Wangmu said. "Last year, about 200 households in our township used methane stoves." 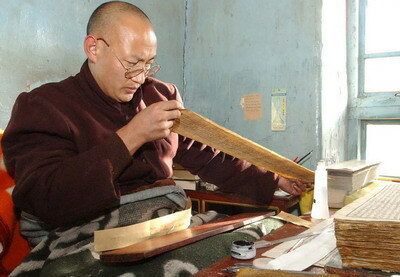 The clean, renewable energy eliminates the need for Tibetans to spend hours each day collecting firewood. Tibet began to experiment with the methane program as it entered the new century to relieve the energy dearth, as well as conserving natural resources in the "roof of the world." The program was officially launched in 2006. So far, nearly 10,000 rural households have used methane stoves. The regional government plans to build 30,000 household methane pits this year to benefit 150,000 farmers and herders. It aims to build methane generating facilities for 250,000 households over the next 10 years. In the industrial sector, the southwestern autonomous region also accords economic development with environmental protection. In July 2006, Tibet started to levy a deposit on mining companies that exploited mineral resources, an effort designed to regulate mining practices and minimize their impact on the fragile ecosystem, local authorities said. As a pillar industry, the mining sector was expected to account for one-third of the regional gross domestic product (GDP) in five to 10 years, said Lu Yan, a senior engineer with the regional geological and mineral exploitation bureau. By the end of 2007, all mining companies operating in Tibet had to pay a deposit, an amount that would not be refundable if their mining activities damaged the local environment, said Wang Baosheng, an official in charge of land and resources in the region. "If there is severe damage to the vegetation, rivers and wetlands, the deposit will be used to remedy the situation." Although no exact figures have been given on how much deposit a company would have to pay, because of complex calculations for respective companies, business insiders said the threshold was pretty high for small companies. "The general principle is to give equal emphasis on environment protection and economic development," Wang said. Tibet currently has 101 known minerals, including chromium, copper, iron and boron. Following a freeze of the mining of gold dust from 2006, the regional government prohibited the exploitation of iron sand from this year. The regional government has also banned the mining of mercury, arsenic and peat to preserve the mineral resources and protect the environment. 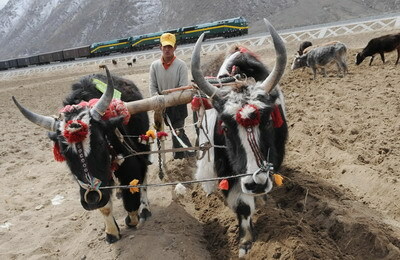 "Tibet is rich in all these resources but has to consider the environmental costs behind excessive mining," Wang said. "Mercury and arsenic mining pollutes water supplies, peat mining can destroy wetlands and gold mining can ruin grasslands and rivers." "A project will not be approved without environmental assessment," Tibet leader Qiangba Puncog said. "We will say no to any environment-damaging project even if it yields gold." While banning mining projects damaging the environment, the region has boosted its tourism industry that is environmentally-friendly and promises quick wealth. 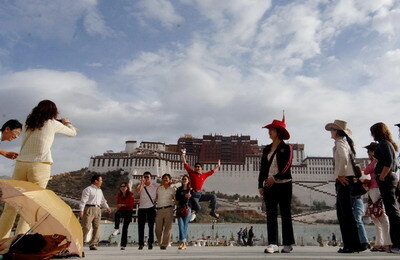 Last year, Tibet received more than 4 million tourists. In Lhasa's stores and supermarkets plastic bags are no long free; many locals also voluntarily clean up garbage at major tourist destinations. 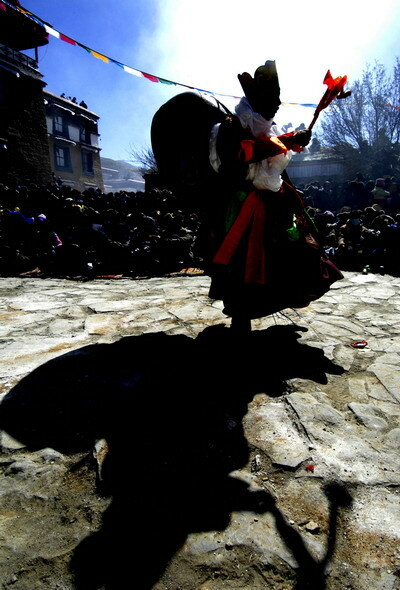 Under such circumstances, a few million tourists won't have much impact on Tibet's environment, said Qiangba Puncog. "We don't foresee any problem even if there are twice as many." The Qinghai-Tibet railway, the world's highest rail line, has carried loads of travelers and pilgrims to Tibet over the past few years, initiating great concern about potential environmental damage. "Measures have been taken to preserve the ecological environment along the 1,956-km route, the first ever railway to link Tibet with the rest of the country," said Qiangba Puncog. "We have set up a long-term system to monitor water, air, noise and ecology at all times," said Zhang Tianhua, vice head of the regional environmental protection bureau. 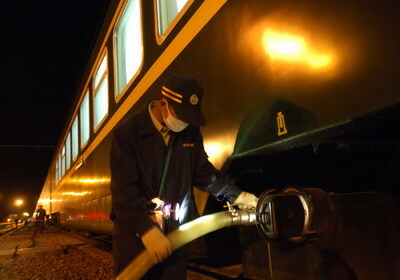 "Every train running on the Qinghai-Tibet Railway has special tanks for storing garbage and waste water. Waste is collected from the trains and treated in designated stations." According to a poll by the State Environmental Protection Administration (SEPA) in June, 96.9 percent of Tibetan residents said they were satisfied with the environmental protection along the Qinghai-Tibet railway. A field investigation along the route found no evidence of damage to the local environment. The landscape, lakes and the frozen earth have been well preserved and wildlife migration patterns have not changed, according to SEPA. Tibet, a barometer for the world's climate, has seen various tell-tale signs of global warming -- shrinking glaciers, frozen earth melting, grasslands turning yellow and river beds drying up. A Tibet Regional Meteorological Bureau study revealed the temperature in the plateau rising by 0.3 degrees Celsius every decade, or about 10 times as fast as the national average per century. The average temperature in Tibet last year, calculated at 4.7 degrees Celsius and 1.2 degrees higher than the previous yearly average, was the second highest in 37 years. It was second to the record high of 4.9 degrees Celsius in 2006. Since 2000, warm winters have been more frequent. Five of the warmest winters in the past 35 years occurred after 2000, said Zhang Hezhen, a senior engineer with the bureau. "The temperature rise in Tibet is a reflection of the global warming trend." Song Shanyun, the Tibet Regional Meteorological Bureau director, added: "Natural disasters from the warming climate, like droughts, landslides, snowstorms and fires, are more frequent and calamitous now. The tolls are more severe and losses are bigger." Statistics show that glaciers at the plateau have melted at an annual average rate of 131.4 sq km over the past three decades. Scientists have even warned that Mount Qomolangma, also known as Mount Everest, which sits in the southern part at 8844.43 meters above sea level, will eventually lose its cover of snow and ice if global warming continues to melt glaciers in the plateau. To ease the pressure posed by global warming on local ecological environment and ensure sustainable development in the region, China is planning to invest more than 10 billion yuan to protect the ecological system of the Tibet Plateau during the 2006-2030 period. Fourteen conservation projects will be launched under the unprecedented program, covering natural grassland and wildlife protection, the establishment of nature reserves, the control of desertification and soil erosion, and geological disasters prevention, said environment official Zhang Yongze. According to the new plan, the government aims to recover 14.96 million hectares of grassland from pastures and restore another 4.2 million hectares of grassland. This will put 77 percent of the region's medium-degraded grassland under protection. The expansion of vegetation coverage in Tibet will help alleviate the impact of sandstorms on China's eastern regions. It will also contribute to the global carbonic balance by keeping 24.5 million tons of carbon per year in the region's ecosystems, said Doje, chief engineer of the regional geological prospecting institute and also one of the project designers.